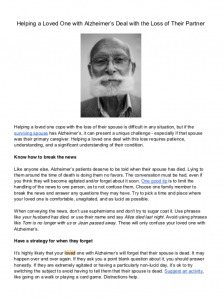 The following is a post from guest writer, Lucille Rosetti, about helping someone with Alzheimer’s deal with loss. You can find more information from her at www.thebereaved.org. Previous PostHonor Your Departed By Living FullyNext PostTerminal Cancer Diagnosis How Will You Cover Costs?